Federal Labor MP and secretary of the Australia-Israel Parliamentary Friendship Group, Michael Danby, says Bob Carr's views on the influence of the pro-Israel lobby are bigoted. Mr Carr hit out at what he calls the "pro-Israel lobby in Melbourne", saying it wielded "extraordinary influence" on Australia's policy during his time in Julia Gillard's cabinet. Speaking to the ABC's 7.30 program, the former foreign minister said "extreme right-wing" pro-Israel lobbyists had an "unhealthy" influence on Australia's policy towards Israel and the Occupied Territories. Mr Carr has detailed his time as foreign minister, and his criticism of the pro-Israel lobby, in his new book, Diary of a Foreign Minister. "Certainly they enjoyed extraordinary influence. I had to resist it and my book tells the story of that resistance," he said. "It needs to be highlighted because I think it reached a very unhealthy level. "I think the great mistake of the pro-Israel lobby in Melbourne is to express an extreme right-wing Israeli view rather than a more tolerant liberal Israeli view," he added. "And in addition to that, to seek to win on everything, to block the foreign minister of Australia through their influence with the Prime Minister's Office, from even making the most routine criticism of Israeli settlement policy using the kind of language that a conservative foreign secretary from the UK would use in a comparable statement." Mr Danby says Mr Carr's "performance" on 7.30 last night was "comical bordering on maniacal" and no lobby group in Australia has that kind of influence. "It's laughable but I suppose in the current climate, as George Brandis says, it's OK to be a bigot," Mr Danby told the ABC's Louise Yaxley. "No-one has that kind of influence. There are various people who have different views in Australian political life and Bob's a big boy. He should be bigger than that. "It was just a silly comment in a silly interview. "People try and get their views expressed, but you know, Bob Carr's view is a caricature. Very sad to see a premier of New South Wales stereotyping people like that. "The interview was very funny and I know lots of people are laughing at the book and they're not laughing with you Bob - they're laughing at you, but it's still very sad to hear these kind of views." This morning Mr Carr defended his comments and said he thought Mr Danby's criticism was extraordinary. "For years I was president of Labor Friends of Israel. I wrote a book, My Reading Life, in which is recommended the book of an Auschwitz survivor as the most important book of the last 100 years," Mr Carr told AM. "My only point about Israel was that settlement activity ought to stop and that the Palestinian status, the increased status in the General Assembly, ought to be not blocked by Australia. "So that's a position that the foreign minister of every European country would endorse and indeed doesn't fall too much short of the foreign policy position of John Kerry. "The fact is the influence the pro-Israel lobby was attempting to exert on the government and did until I stood up to them was not in the interests of Israel, not in the interests of the Middle East peace, and was being inappropriately and bullyingly (sic) exercised in the government. "It needed to be resisted and I'm proud to have done that." What do you think about Bob Carr's comments? Have your say. Mr Carr and Ms Gillard came to political blows over her planned support for Israel during a crucial vote in the United Nations, and Mr Carr effectively rolled the former prime minister on the issue in caucus. "I had to resist it, and my book tells the story of that resistance, coming to a climax when there was a dispute on the floor of caucus about my recommendation that we we don't block the Palestinian bid for increased non-state status at the United Nations," Mr Carr said. Mr Danby defended Ms Gillard's position on the UN vote. "I think she took that position because she believed that the best way to a peace settlement - and I've tried to explain this to Bob time and time again and to end the issue of the settlements - is a peace settlement," Mr Danby said. "So he knows he's playing with everyone, that a lot of these areas will be involved in territorial swaps between the two sides." Mr Carr's comments reflect the bitter debate within Labor about its policy on Palestinian and Israeli settlements, which has been simmering in recent weeks. Labor leader Bill Shorten gave a speech recently where he said that some Israeli settlements were illegal, which caused controversy within the party because the policy is that all of the settlements are illegal. "What we should do is agree on all of the issues that we agree about and that is that it's very unhelpful for settlements to be built in the West Bank," Mr Danby said when asked about the issue. "Those of us that are realistic about these kind of issues think that there are small areas around Jerusalem which will be part of a territorial land swap." Mr Carr, who switched his support to Kevin Rudd just before the leadership ballot that saw Ms Gillard ousted, says the former prime minister was selfish to cling to the Labor leadership for as long as she did. "We all wanted Julia to work. Even after my disagreement in October/November 2012 on matters relating to Palestinian status and the Middle East, I was still committed to her," he said. "But by the time we decided in our wisdom as a cabinet to go to war with the newspapers, I thought the very viability of social democracy in Australia, of a viable Australian Labor Party, was now at stake. "So with some reluctance and with respect for her, but real doubts about her political judgement, I moved into the Rudd camp." Mr Danby says in retrospect, it was a mistake for Ms Gillard to bring Mr Carr in as foreign minister. "He criticises prime minister Gillard and the former government and Cabinet processes on the program," he said. "I haven't read the book. I've only seen excerpts and I only saw the interview, but here's a bloke plucked from obscurity who was not working as a current politician, a former provincial premier who dumps on Gillard and the former Labor government," he said. "The Labor Party supported him all of his political life. How about a bit of decency? It's a bit of ingratitude in my view. "I think in retrospect - given all of the division that he caused and his obvious dislike even of her [Ms Gillard] voice - it does seem it was a mistake, but now he seems obsessed with the food that he got on the plane and his diet and which ties [to wear] and upgrades to first class, so he'll have plenty of time to concentrate on those now." Comments on this story are closed. Well I certainly supported Bob Carr's view that we shouldn't try and block the Palestinians from having a voice in the UN discussions surrounding the massive Palestine-Israel problem. I mean cmon, its laughable to think otherwise. Imagine Australia was involved in a bitter dispute about land, settlement and war games with a neighbouring country, and we were blocked from participating in UN discussions set up specifically to come to an agreement for a solution. I would have thought the Israeli lobby would at least be willing to hear the opposing view in any dispute they are involved in. But for the lobby to have this view and for Gillard to be one of the few in the then government who agreed to it, it certainly makes me think Bob is likely to be correct and that the influence the lobby has, is in fact, at least too influential. I'd also like to know what discussions and meetings Gillard had with the Palestinian lobby. Danby: Which hat? : His electorate or a Jewish Lobby Group? Private companies are being used to conceal huge political donations possibly for a promise to give the donor favourable treatment in return . So Australians vote blindly on general policy speeches, but have no way of knowing the secret agendas they support. Likely agendas include:- Australia's domestic and foreign policy, trade agreements, foreign-worker quotas, mining taxes, monopoly media ownership and foreign ownership. Yes, we DO have a democracy with one person, one (blind) vote: but the wealthiest donor can now become a default dictator. At least we should KNOW if our vote supports wars to protect Israel, or condones the immoral theft of Palestinian lands or is all for selling Australia to foreign corporate cronies. The irony is Michael Danby is very much admired for his speaking up for Tibetans in Parliament and yet he cannot see that although Israelis have in common with Tibetans a need to preserve their Jewish culture and small unique population, in every other respect the Tibetans have far more in common with Palestinians when it comes to facts on the ground. Both live daily under the jack boot of a large superior army (the former being under the Chinese military and the latter the Israeli and US military) Both Tibetans and Palestinians have little to no recourse when it comes to addressing the totally disproportionate use of use force and control these armies yield over their daily lives. Sadly the Tibetan movement realises they need US influence and this has often meant aligning themselves with Israel and due the disproportionate influence they know the Israeli lobby also have in making US policy. Yet he describes Bob Carr as someone who's been "plucked from obscurity". A globally famous Israeli choreographer, Ohad Naharin, spoke of his governments atrocities. He was interviewed on the ABC's Margaret Throsby Show not so long ago. I believe he has suffered as a result, to some extent, but I couldn't believe my ears at the time of hearing him speak honestly! Thanks to the ABC and the talented Margaret for that one too. 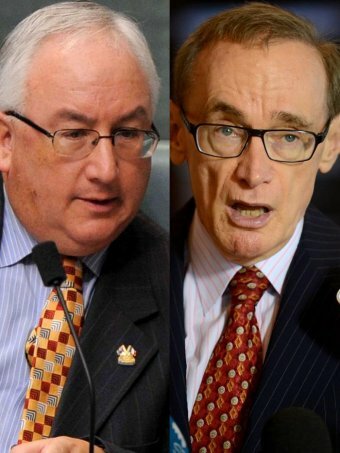 Bob Carr a "Provincial Premier"? Mayor of Coffs Harbour? Get real. I know whose intellectual integrity I respect more. Mr Carr's views should be taken seriously instead of being savaged intemperately. Mr Danby's language exposes an all too prevalent bias and the potential for powerful lobby groups to skew our nation's policies. What is more interesting than the fact that the Pro-Israel Lobby is able to influence the PM on matters of foreign policy, is the fact that when they get caught out the Pro - Israel Lobby goes on the attack. To my mind this is clearly an attempt to shuut down rational debate. By using the term "bigot" and linking Mr carrs Comments to the statement by Mr Brandis this is a clear attepmt to label any criticism of Israeli policy as anti-semitism. For a member of parliament to make this comment against Mr Carr, on wonders whose interests Mr Danby really represents? 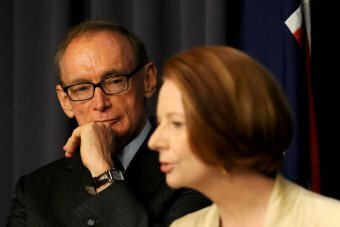 The witty and very intelligent Bob Carr has always used the labor party as a tool now he has them in the palm of his hand yet again as they unintentionally beat up the publicity for his memoirs. You have to Laugh!! '''and this is Another massive free kick to Tony Abbott from ALP central. Danby calls Carr a former 'provincial premier'! What does that make the Member for Melbourne Ports -- a burgher from the boondocks? Judging by Danby's hysterical squealing, Carr's comments must have hit the mark. Good on Mr Carr - Israel has behaved appalingly in stealing land from the Palestinians and I am thoroughly ashamed that Australia did not condemn them. I agree that the right wing Israeli lobby has far too much power and Mr Danby was given far too much air time! I am definitelly not interested in Mr Danby's views on the matter. Good to see that looking on the Internet and The ABC are not afraid to allow us to discuss the Zionist cause and see how it has brought about a rethink. We just can't ignore, or do a Murdoch, and ignore what is going on in Palestine. CAN WE? I know that pointing out Israeli Quote is not liked by many outlets but they do show the trend of what is happening. Have a look at the "Quotes" of past and present leaders and you will see that the destruction of Palestine is paramount. There are some pretty choice quotes from shockingly honest Zionists. Bob Carr may well have his faults, but the fact that this one comment has attracted the attention it has makes me think he's hit the nail on the head with a certain group. The Zionist Council of Victoria awarded Julia with their 2013 Jerusalem Prize for her 'outstanding contribution to strengthening Australia's connection with Israel'. Attempts to block Palenstine's observer status with the UN, slavish devotion to Israeli policy in the middle east - here's the prize. No wonder Bob switched his allegiance to Rudd. All things are subject to interpretation, whichever interpretation prevails at a given time is a function of power and not truth. Israel is a democratic society and a firm allied member of civilised nations in the West, what the current regimes in both the US & Europe considers to be good for the philistines is greatly mistaken and pandering to the bullies in islam who clearly desire Israels destruction by suicide to give up their patch of land. As for philistines, they don't even know how to honour & respect any rules, let alone sophisticated laws needed to adequately run, govern & make grow a Just and Humane society. To be talking about creating ANOTHER State for islam at this stage of islam's game is insane, promoting further pain effectively adding insult to injury to the poor people on the ground who will be FORCED to live under islam. So it is on this basis for starters that their is no such thing as a philistine state, who were already given gaza with which to proven themselves that has become nothing but a disaster. The best the philistines can do now is to either live peaceably under Israeli law or go live under the many islamic states that can already be easily found in their region, like where they are now in Jordan. However I know which one I would choose and believe the Syrian population are already begging the Israelis to take them over too. Danby shooting himself in the foot and blowing his party out of the water. Great work, Danby. You have convinced me that the members of both major parties are only interested in themselves as opposed to the people of Australia. Bring on the minorities. I have been a long-time supporter of Israel's right to live in peace behind internationally recognised borders but the ongoing settlement activity on Palestinian land has led me to conclude that the current crop of Israeli MPs – especially the PM - do not want to see a viable Palestinian state created. Everyone knows the settlement activity is by far the biggest impediment to progressing the peace talks towards a 2 state solution; why shoudl the Palestinians engage in talks while Israel goes on building houses on their land? So the critics of Bob Car's assessment of how much influence the Israeli lobby has on our government (in this case Julia Gillard) must answer this question: why did her government, or even the current Australian government, not issued any statement speaking out against ongoing Israeli settlement activity on what everybody agrees is the land that will be a future Palestinian state? The General's Son: Journey of an Israeli in Palestine by Miko Peled and Goliath, by Max Blumenthal who paints a startling portrait of Israeli society under the siege of increasingly authoritarian politics as the occupation of the Palestinians deepens. Then again, for a dose of real medicine, I thoroughly recommend that anyone wishing to expand their understanding of this complex issue should allude to Norman Findelstein's conversations via YouTube! It's a great pity that Carr's comments have brought out antisemites in the community on this website who make all sorts of exaggerated claims about pervasive Jewish power as if it is unitary and eternal. It is not. I say this is someone who is quite involved with a progressive Jewish organisation that has struggled to get its views across in Canberra and elsewhere for nearly 30 years. It is true that there are some very well-financed and politically-aggressive pro-Israel organisations in Australia. In fact, as Carr says, they have adopted what is known in Israel as the settler agenda, that is, justifying the Occupation and everything that goes with it, and the situation has got worse as the years have gone by. Extraordinarily, Mark Leibler doen't even bat an eyelid about having access to generations of prime ministers when others in the community, not just on matters of Israel, but on all manner of policy, can't even get an appointment with a Minister. There is no balance here that give opportunity to other voices and break MPs isolation. Sadly, the lobby groups who carry this agenda also devote their efforts to trying to discredit the efforts of dissenters, Jewish or otherwise, as marginal "bigots". It's untrue of course, untrue as the racist posts that appear on the ABC website (which AIJAC and others will then complain about). Other points of view (Jewish, Palestinian, everyone else) need to be heard . Otherwise, MPS will remain captured by the Lobby. This might have meant something if it wasn't simple minded media play to promote his book. And of course, the ABC is right there to support a supporter, by giving it air. If it wasn't so blatant a self publicity stunt, one could support the notion that we give an astounding amount of support to Israel for no deserved reason. I respect members of the Jewish faith, just as I accept all those who believe in God. Fanatical Israelite patriotism is a totally different matter - they have illegally captured and retained Palestine territory, with force inc torture and murder. I have no respect for the State of Israel, and have at times written to Abbott, Danby, Gillard, Dreyfyus, Rudd, and Frydenberg protesting this MPS pro-Irael approach. The State of Israel is a terrorist one, and should be treated as an enemy. Bob Carr has well and truly spoken the truth. On a broader point about party donations - any company or lobby group that donates to both parties is surely doing so for influence rather than ideology? There are many documented examples of this so not sure why it's even an open question as to whether campaign donations buy you political influence? Having worked with Israeli's for several years they are all about control and influence. Have a look at how many hold corporate positions of power. Bankers, Lawyers, Judges and Politicians and big business CEO's. I had a budget in my dept and I thought they would want me to save them money by shopping around. However this was not the case. I remember being taken before the board and handed a list of Jewish run companies and told "this is who you will buy from"! This is how they become powerful. Good on you Mr Carr for being gutsy enough to come forward with your experiences. He who protest loudest usually has the most to hide. I am against bigotry. Telling something as it is can hardly be called bigotry! "Danby was born in Melbourne, Victoria and lives in Elwood, in his electorate. Danby attended Mount Scopus Memorial College (a Jewish day school in the Melbourne suburb of Burwood) and then enrolled in a Bachelor of Arts at Melbourne University but left without completing the degree. He was President of the Melbourne University Student Union as well as President of the Australasian Union of Jewish Students. From 1979 to 1983 Danby was manager of Halmaag Art Galleries in Malvern. He was Assistant Private Secretary to Barry Cohen, a minister in the Hawke government 1983-84, and Editor of the "Australia-Israel Review" (published by the Australia/Israel & Jewish Affairs Council) from 1986-93. Danby was the only Jewish member of the Australian Parliament from 1998 to 2007, when Mark Dreyfus, also from the ALP, was elected." But then that is how Israel gets away with their actions. Think Murder, think forged passports. I am seeing a lot of scape goating against Jews and Israel on this board, from being the reason for global terrorism, 9/11, the GFC, causing all the ills in the Middle East, exploiting the world with guilt over the Holocaust. One point that is not being addressed is the negative sides of Israel's opponents. Israel is not fighting against little cherubs. Israel is in a war with powerful groups whose purpose is to destroy their nation and "obliterate" their people! Read the Hamas charter. So Israel is fighting with everything it's got against these groups, playing the dirty politics game for that has been played by any country in a conflict for millennia. Fact 1, from the proposed Palestinian state to the Mediterranean sea the smallest distance is 9 miles! you try defending that against groups intent on your murder. The reason Arabs and Iranians cant allow Israelis some tiny strips on the edge of the Middle East is because Arab pride and Islam would not allow it. The Arabs will get a Palestinian state but there will never stop being Muslim extremist groups trying to live out the victories against Crusaders and those of the prophet Mohammad. If Israel and Jews are aggressive on this topic it is because so is its opposition! I have no idea how Carr could possibly be called a bigot for what he said. Michael Dandy, whoever he is, needs to get a grip. There is nothing cheaper than drawing the racism/bigot card whenever you don't agree with their opinion. There is nothing remotely bigoted about what Bob Carr said, regardless of you position on Israel. He needs to look up the meaning of the word. And I would suggest to this Dandy character that Bob Carr, whilst flawed, has a hell of a lot more runs on the board than himself, who is basically an inconsequential nobody. Looks like the Mohel got the wrong bit.Based on Danbys offensive criteria for bigotry, I wear the badge with pride. Which country uses our sovereignty in false passports and gets away with it? Clue.They tortured and murdered an Australian citizen in their cells. It is about time Australian political parties abolished their religious factions,Australia is a secular nation and religion has no place in our internal politics or our foreign policy. As for Bobs statements about Julia Gillard being overly influenced by the Jewish lobby this is only one example of her puppet mentality,her ignorant rant against the decriminalization of drugs a topic which Bob had initiated a rational debate about during her absence on one of her many overseas trips would have been expected from the likes of George Bush or Tony Abbott not a Labor PM. Wow a debate on this, I would say Carr's criticism's are relevant in the UK and the US also. How long are you allowed to milk the sympathy vote.People and Nations have suffered through the time of History and to claim the most persecuted of all, does not give you better rights over others.I am sure Israel is a great Nation of great people but having a finical and political elite running a debate without criticism can not be sustained. The Australian parliament is full of foreigners with foreign agendas. Look at the central banks all around the world, the Israelis have taken control of the central banks, global finance, the global media and think that they are above the law. If you own the politicians, the bar, the law society, it is easy to get away with being above the law. Look at Abbott, Pyne, Hockey, Turnbell etc all roman cathaholics, whose first allegiance is to the Vatican. The Roman empire is even larger and more powerful now than when they murdered jesus. The ALP is no better, they work for foreign interests first and then just put out propaganda to voters. That is what you get with capitalist democracies. What is the difference between China and Australia? In China they have got one party that works for the whole country, in Australia we have got 2 parties that work for foreign corporations. As soon as the ALPLNP vote drops below 50% they will merge. The foreign controllers don't care whether its the ALP or LNP in charge of the show, just as long as its one of them and the foreigners have control of the Australian budget and military. The very stridency of the cries of anti-semitism to any critics of Israel shows that they know the criticisms are true and to the point, and Bob Carr should be applauded for having the intellectual courage to ignore the apologists for Israeli crimes. For decades Israel has been using the West's feelings of guilt at closing their borders to Jews fleeing Nazi oppression to get away with all sorts of egregious ethnic based oppression and acts of terror against the people of the former nation of Palestine. And for those who dispute my "acts of terror" comment I ask would you not be terrified if you and your family were held at gunpoint by soldiers of an occupying army while armoured military bulldozers destroyed your home because a relative of yours committed a crime against those oppressing them? ccording to international law the continual occupation and settlement of parts of Palestine is illegal. Calling it as such does not implicitly or explicitly define one as a bigot it is just stating a fact. It seems that the collective guilt that the West still feels for the tragedy of the Holocaust prevents us being objective about the situation lest we raise the spectre of anti-Semitism. What is needed is a more courageous. open and transparent conversation about what we as global citizens hold as common human values and rights, not an ideologically driven agenda from either side that constrains the conversation to a win/lose perspective. Shame on Danby for not showing the courage and willingness to engage in better meaning making and instead trying to close the conversation down so that it fits with his own limited perspective and assumptions. With thinking like this, nothing will change in the Middle East. Agreed Seamus1997 and other awakened souls, the Israel lobby are zealous in defending their excessive influence. The usual form of defence prevails, attack the man, NOT his viewpoint... says it all !!! Maybe Mr Danby watched a different interview to the one I watched. It was obvious that Bob Carr was telling the truth. I love first class travel too. One can function after arrival at the destination, rather than having woolly head at meetings or making ridiculous claims of someone being maniacal. Bob Carr is absolutely correct in respect of the unhealthy relationship between the Zionist driven Jewish Lobby and its relationship with the Australian Federal Govt. How is it possible that Tony Abbott has apparently described himself as a "Zionist" and also stated that he believes in Israel's right to not only keep expanding the "settlements", but continue to occupy (steal) Palestinian land? No lobbyists or lobby groups like have the spotlight shone on them. I think the reaction of Danby and a handful of the Australian Israeli community is silly. The Australian public are well aware of the influence of such organisations and that political decisions are often the result of back room deals and manipulation rather than an open and honest democratic process. Bob Carr is just telling the truth. One day we will get a PM with courage and leadership who will reign in these groups and limit their influence. The best way to do that is force them to operate in the public eye at all times. It isn't rocket science. When one sees the political power available to one moneyed individual such as Clive then the Jewish cabal in Melbourne must be a force to reckon with. Casting the slur of 'bigot' is just a part of the bullying tactics. Why didn't Carr create this controversy before he started selling his book?! This topic is fantastic PR for his book, more sales means more first class flight tickets. Bob Carr - NSW - promoting his book. Got to agree with Carr, there are so many bad things going on in the middle east, mostly led by Israel, and the Government stays silent on those issues, and even the media hardly pick up on them. So Bob Carr was "plucked from obscurity"?? And just who is this massively famous Michael Danby? A (paid?) lobbyist for the Israeli government but wearing an Aussie MP's clothes. There is the real humour in this story. The bigger laugh of course is Danby trying to downplay any undue influence... from a group that calls itself the "Australia-Israel Parliamentary Friendship Group". What does this group do? Play chess on the weekends? The Australian government's long-term abject silence on the illegal settlements is proof enough of this 'undue influence'. Then again, ever since 2003 when Australia willfully joined the US and the UK in the 21st century's first major war crime, our moral voice on the international stage has lost virtually all credibility. All of this could have been avoided if the 1940's idea of Frank (Critchley) Parker had been taken up and Tasmania chosen as a home for the Jewish Settlements. Tassie would now be a thriving industrial state and all the acrimony in the Middle East would have been avoided. Mr Danby could take summer holidays and vist Mona while Bob Carr could fly off first class concentrating on other issues. Overall, another sad episode for the ALP. Good on Bob Carr for being honest with the people of Australia. It's obvious that donors of large sums of money expect something in return. Danby, in trying to hide the fact by attacking Carr is part of the prolonging of the problem. If Labor is serious about becoming appealing to the people again, start by cleaning out the influence of donors and clean out those from inside the party that want such behaviour protected. Good work Bob, your luring them out of the woodwork. Coalition should take heed too 'cos the intentions they've projected and policies they've pursued make them even MORE 'under the influence'. Carr along with Rudd are the cretinous, vacuous pin up boys of what is so wrong with Labor. Both of them achieved high office only to either do nothing or wreck the joint. It is inappropriate for the Jewish people to leverage the suffering of their ancestors and invoke racial victim status to deflect legitimate criticism of imperialist Israeli foreign policy. While this ploy may still be effective with some audiences, please don't insult the intelligence of Australians by attempting it here. What a hoot! Danby calls Carr, in a derogatory manner; "a former provincial premier" and describes him as; "plucked from obscurity". Regardless of whether or not they like him or agree with him, most people would agree that Bob Carr has more ability and achievements to his name than the majority of politicians including Danby, will ever have in their lifetime. He is certainly better known than Danby. Danby WHO??? The people of Israel are NEVER wrong. The state of Israel is NEVER wrong. Everybody else may be WRONG however. When the above mentality, mixed with the concept of an Almighty God coming from their own race, you can bet your money that anything NOT in support of Israel will be invariably shot down and ridiculed. That's given. Have you ever wondered why the question of conflict of loyalty of Australians who loudly protect the interests of Israel hardly arises? Same in other countries with a pre-dominant Christian belief. If one looks at the US one can see the most powerful Israel-lobbying force has influenced the foreign policies of successive US governments over the years. As an example, the Iraq war based on phantom WMD of Saddam Hussein has its very root in Paul Wolfowitz, an Israeli-American. It indirectly led to the GFC which has significantly damaged the strategic power of the US in the global politics context. To persuade public opinion, they have powerful media from Murdoch (eg FOXNEWS, the Australian) to stifle sensible and logical discussions. Politicians are either bought or get scared of Murdoch's power for speaking out against Israel. So they keep their mouth shut. In brief, the long term interests of this country & its people are NOT automatically the same as that of Israel. As for the average mob, as long as they have bread and FOXEL they would not care less if ROME is slowly destroyed. Where is the Eureka spirit of Australian pioneers, I wonder? I have to comment that I find it unhelpful in the discussion for Carr to be called a bigot (or at least alluded to that fact). This is a man who can stand up and say that's a stupid comment to make as Carr proved in his response. It is people like Mr Danby's comment that lower the truth of whom is a bigot and who is not. It is a 'you do not agree with me so you must be a bigot' argument. A case of the first person who calls a person a bigot is in fact themselves a bigot. Having a different view does not mean you are a bigot. Its the word of the moment and a cheap and tasteless retort. The Labor party has a few politicians whose main causes are not those of Labor. For example, Joe Bullock the recently elected WA senator has a first love of the Catholic Church while Michael Danby has always put Israel first. Politicians who support extraneous causes add to our diversity, but those who owe their first allegiance to other than the great Australian people in all its variety are dangerous to diversity, just as dangerous as the Abbott government with its appalling fealty to the upper crust and commercial lobby interests. Having followed extensively the Palestinian causes on Facebook and Israeli news sites over the past 5 years, one easily draws a conclusion of disrespect for apartheid, racist, mono-religious Israel- and 90% of right wing Israeli religious settlers are just that. If these hateful religious nutters weren't supported by the Israeli population at large and the hugh politically influenced very wealthy 'Jewish' folk in America, Canada, Australia etc, the whole mess in Israel and Palestine would be over. Bob Carr is calling it correctly. And it's so pathetic to have any criticism of Israel tagged with being anti-Semitic etc, which just bogs the whole need for mature redemptive action into a quagmire of disbelief for their stupidity and recalcitrant ideology. Better late than never for Bob Carr to speak some truth. This 'relationship' has been well known for many years, good that it has been made more openly public for once. Far be it from me to agree with Bob Carr, but on Israel he is spot on. As soon as someone speaks out about Israeli policy, they must be antisemitic which is just complete nonsense. Israel is practising slow but steady genocide against the Palestinians and they are being allowed to get away with it, playing the antisemitism card when the criticism gets too difficult and close to the truth. "Antisemitism (also spelled anti-semitism or anti-Semitism) is prejudice, hatred of, or discrimination against Jews for reasons connected to their Jewish religion or heritage. A person who holds such positions is called an "antisemite". As Jews are an ethnoreligious group, antisemitism is generally considered a form of racism. Criticism of Israeli policy towards Palestine has nothing to do with their religion or ethinicity, but has everything to do with their lack of humanity due to their appalling treatment of the dispossessed Palestinians. It seems that Mr Danby is also under the influence of the pro-Israel lobby group. With such a vehement reaction to a very reasonable stance perhaps he has been goaded into action? It is very well that Michael Danby asserts that many are laughing at Bob Carr, however many more are laughing at the ALP. It leads a tenuous existence at best. Danby says "So he knows he's playing with everyone, that a lot of these (I assume settlement) areas will be involved in territorial swaps between the two sides." but that leaves the question if the Israeli settlements go too far prior to any final peace deal then what will the Palestinians have left to swap ? I don't buy Danby's criticisms, he's blustering and I don't know who he thinks he's fooling when he says that no lobby group has that kind of influence, that's cowdust, lobby groups with way too much power are the single biggest threat to our democracy, such as it is. And Danby should realise that lobby groups with way too much power are also the single biggest threat to the major political parties and if he doesn't believe that he should have a look at the Greens post WA senate election research and analysis. During my time in Israel I was impressed by the number of people who were not extremists, but as the first interfada gained strength there was a concern about the government and the society taking a lurch to the right. That happened, and external observers needed to adjust their viewpoint, which is what I suspect Carr did when it came to the provocative act of allowing Israeli settlements on the west bank. That doesn't explain the concerns he has expressed in his book about Melbourne Jewry. The real and serious issues here seem to be getting buried in the dispute over who said what and why. We need to keep focused on the real issues. Labor are so divided on so many issues it's very hard to take them seriously Bob Carr is just a media tart in reality stirring the pot for a bit of personal PR. Not a good look guys. I am not surprised at all. Under Gillard and even more so under Abbott Australian foreign policy has been very biased towards the Israeli occupation of Palestinian lands and the subjugation of the Palestinian people." You have to remember we are still very much under the US influence. They still pull the Strings on our foreign policies. The day we are capable of standing on our own 'Diplomatic' legs will be the day we grow-up as a nation. You only have to look how we entered an Illegal war in IRAQ.. and that sickening 'ALL THE WAY WITH LBJ' into Vietnam. Once again Australians are seemingly witnessing the machinations of influential little groups that place their religious and non Australian beliefs well above the concerns of our great nations independent advancement. Another flogging to nothing, another deep encroachment into the fabled belief that we are an egalitarian society, another dilution of our nations indepence and goodwill. The Israeli community is seemingly corrupted beyond belief, and the continuity of their disgraceful behaviour in the Middle East confirms to me, they along with their military allies are among the most dangerous of nations. Bob Carr is most probably correct I believe in saying the Jews fundamentally had too much influence. For the sake of world peace they should be minimised politically and encouraged to return from whence they came, Europe. Isreaels proven inability to peacefully integrate with other Middle Eastern nations after the education of WW2 more than indicates to me that they are basically a war mongering nation. Without holding a massive monetary and military advantage they as a nation amount to very little morally, intellectualy and globally. By bringing the subject of devaluing Jewish influences into the community forum Bob has again highlighted how vulnerable to negativity and extremist views our elected leaders are. I see little value in the "point trading" verbal interaction between Bob and Danby, both have regressed Australia and we desperately need to move on regardless. The only time Micheal Danby speaks out is when some one has dared suggest Israel might not be the greatest country in the world. Thats why Danby is known as the member for Israel. For some strange reason, Danby's electorate of Melbourne Ports includes the illegal settlements in the occupied territories. Ive never seen nor heard him speak out on any other topic-"Israel good, Palestine bad" is all he manages to pop his head up for on his occasional foray into public speaking on behalf of his constituents, the Israel lobby - Google Micheal Danby and that's all you will find. I have never come across a politician so stupid to talk about his/her travel arrangement when on Government Business like Robert Carr. He did a Brutus to Julia Gillard the very person who brought him from Political obscurity to limelight. He is a man devoid of policies and principles. We cannot expect anything better from a man who is unreliable and unpredictable. What a shame that we had a Foreign Minister of his calibre. They always drag out the old "bigot" card whenever they want to stifle discussion of an issue. It usually means that the comment(s) are getting to close to the truth. Bob Carr is absolutely right , and Danby's comments the Carrs comments are "maniacal" prove Carrs point perfectly. The Pro Isreal lobby , will not permit a contrary point of view , and that my friend is what living in a democracy is: Allowing the other person to voice their opinion. Considering Israel is a massive scale militaristic colonisation, with viking-looking beards and the lot, one can only assume this "Australia-Israel Parliamentary Friendship Group" has some influence. Danby, laughing and calling people bigots.... Clearly he doesn't know much about "Friendship"
I thought the only interesting thing said by Bob Carr was if he had been PM he would not have dismantled the Pacific Solution. Bob Carr is absolutely right and has the guts to say so. Well done Mr. Carr. Israeli lobby has been exerting an unhealthy influence over Australian politics for eons and it is about time that somebody like Bob Carr exposes these practices and stands up to these bigots and bullies. It is people like Danby who are bigots and his interview borders on the maniacal. Mr Danby, is pro Jewish, a traitor to the labour party and Australia. Remember, people all over the world are watching Austrlaia's policy towards the Palestinians, especially the issue of illegal settlement. They are "illegal" and no amount of words can describe them as legal. Remember, Mr Danby you are doing your party and Australia a disservice by burying your head in the sand and distorting the evidence on the ground. This does not help the Middle East peace issue. Thank you Mr Carr for airing this issue publicly. I have not voted for the Labour or Liberal parties, and now I will never do so. I hope people who care about what is right in the middle East will act accordingly too. I have no argument with the jewish people, but I have a major concern with the government of Israel. The current government of Israel comes across to me as a terrorist state through and through. And I am disgusted by the Australian governments of both political; colour who have supported the governments of Israel to disenfranchise the people of Palestine. I understand however that many other Australians have a different view. Bob Carr is truly a showman. He was the one who solemnly declared that he will bring down the hospital waiting list in NSW when he canvassed for power in 1995 state election. He even said that he would write that promise with his blood. How dare can he talk about Israel and conspiracy and so on. Does he know the Bible does he know the history? Is he pandering to the populous muslim friends? He promised sun and the moon as any Labor politician does and never delivered. When he retired from Parliament he landed a lucrative job at Macquarie Bank. Is he worth what he thinks he is? Come on Bob come to the real world. Just think about your promises Parramatta to Epping rail link promised at every election, with no result. Ask away I say. Best to have ALL information than that which one side only wants you to have. Everybody seems to have influence on the Prime Minister of the day, except the poor folks slogging it out in 9-to-5, trying to get permanant jobs, trying to cover their costs and secure affordable housing. The executive are so full of themselves they cannot see us in their shadows until election time. Most of us would love a 4 year job where all of your expenses are covered, not these offers of millions of jobs stripped of the pay and conditions that real jobs have. Off topic? maybe, but foriegn policy is lies within lies. Rarely is it about what is good for the populace but more about posturing for the benefit of politicians of the day. Politicians corrupting the politicians of another country. Yes, pro-Israel lobby group has "extraordinary influence" on Australia's policy. If the Palestinian problem has been solved long time ago, "9/11" wouldn't happen, 90% of the world's terrorist problem would disappear. Why is it an act of bigotry to state an opinion that a certain group had undue influence? It simply isn't, it's an expression of a view which does not indicate prejudice or intolerance of any kind. By all means be critical of Mr Carr if your view is that he is wrong on this particular matter (even though very few people would possess enough inside knowledge to make an informed view about it), but calling him a bigot based on that, I believe would grossly overstate what it actually was, and misuses the word in a way which appears opportunistic and highly dramatic. In my view, at least part of the intention of any person who employs this kind of tactic is to attempt to demonise others who might share the opinion which they are critical of in a way seeks to vilify. That itself, under the same terms of judgement used by Mr Danby, would be a form of bigotry. Lastly, it seems to me quite plausible that what Mr Carr claims may well be true. I will no doubt cop flak for saying that it does seem that our government was very hesitant to be critical of so many things that occurred in relation to the West Bank or Gaza which deserved to be challenged on a diplomatic level. This doesn't make me an anti Semite, I am someone who is appalled by all acts of suppression which deprive any people their basic human rights. I thus hold the view that our governments were, and are still, guilty in that regard, particularly so in relation to Australia's indigenous peoples. Bob Carr is trying to sell a book. He is neither the first nor the last to do it. He is right about the strength of the Israeli lobby. Supporting the illegal expansion of settlements in the occupied territories in not helpful to the peace process. It's high time the Zionist are seen for what they are... No different from other radical groups, without a moral compass. When you look at the ghettoes in Israel, West bank, Gaza strip it does take you back 70 years. All Danby is doing is protecting a radical group who also has the US as protectors. What is amazing is just how long it has taken to start look at this regime in Israel with the spotlight on instead of the US filter that it has, and still is, enjoying. They have managed a regime of censorship for far to long. Those who cannot tolerate criticism will never learn. To enshrine religious segregation into a country's constitution in the way that Israel does is diametrically opposite to everything that our Australian values stand for. You will understand what this means if you ever fly on an Israeli airliner and you are not Jewish. So we shouldn't be supporting them unconditionally, like a puppet on a string. We should be voicing our opposition to their heinous behaviour at every opportunity. Anyone who criticises Israel is labelled "anti-semitic". It is a defence that is both inaccurate and in denial of reality. Good on you Bob Carr for having the honesty and courage to say it as it is. I don't think anyone has a problem with people lobbying the government. I think the problem is when the former minister talks about a lobby group having "extraordinary influence" and engaged in "bullying". To clarify matters, the former minister should detail how this was achieved, and name the people who were applying this type of pressure - and what the threat was if the government didn't see things "their way." While there may be some truth in Bob Carr's assessment of the influence of the pro-Israel Lobby on Labor party thinking and policies..it is hard not to see Bob Carr as some sort of prima-donna foreign minister in his time in the seat who was just using the position for free overseas travel for him and his wife at taxpayers expense. Also Bob Carr's selective bias in dealing with certain foreign affairs intervention in particular individuals' problems should be called into question too. Altogether it is yet another example of over-inflated egos and ideas at the top levels of Labor government, that cannot deal with issues in an efficient , effective and pragmatic way..from home insulation scheme (which should have been a winner and no-brainer)..to the Julian Assange case which should have been put to bed effectively but not by allowing him to slowly rot away in a foreign embassy at the mercy of at least 3 governments. Sorry Bob you come across to many of us as a pompous, arrogant person who really is more interested in Bob Carr than about how to correct institutio9nal probelms within the Labor Party. The hypocrisy of Israel and it's supporters like Mr Danby is staggering. There will never be peace in the middle east as long any sensible debate is shutdown with howls of antisemitism. A two state solution is the only fair and reasonable outcome - Israel and Palestine. I'm rather indifferent to Bob Carr, but Mr Danby would have done better to refute the former Foreign Minister's argument than launch an hysterical personal attack. He protesteth too much, methinks and in the process stifles proper discussion of whether Mr Carr's argument is right or wrong. So if you have a view that *might* be critical of Israel you're automatically a bigot? I find it extraordinary that when someone is trying to have a reasonable debate about Israeli matters they are labelled a bigot. This resort to playing the antisemitism card when anything significant about Israeli policies are raised does their cause no good and is aimed at suppressing debate - hardly a good look for someone putting themselves forward as a representative in what is claimed to be a democracy. I am not surprised at all. Under Gillard and even more so under Abbott Australian foreign policy has been very biased towards the Israeli occupation of Palestinian lands and the subjugation of the Palestinian people. Mr Carr is a show pony and belongs to a political party which is corrupt and greedy. Just look at it and Mr Carr is part of that culture top to bottom. He was and is an embarrassment. As an Australian I am constantly ashamed and embarrassed by the quality of "debate" that takes place in our governments, but this childish tirade from Michael Danby is taking it to a new low. Australian politics today bears all the hallmarks of a WWE 20 man elimination match, but nowhere near as mature. Conspiracy theory - Danby is an Israeli operative placed into the Labor Party to neutralise opponents. The powerful drug he gave to Julia (probably using a hypodermic umbrella) was the cause of her lack of judgement. Earl Grey- spot on - and if I may add: I stopped taking Bob Carr seriously when he came out in complete agreement with Vincent Bugliosi , who believes Lee Harvey Oswald was solely responsible for the assassination of President John Kennedy. I was stunned as to how an apparently intelligent , well read Politician , an ex-Premier and a Foreign Minister of this intelligent country - after all the evidence gathered over decades, and on the public record since official US Government hearings from the 1970's onwards - could believe that one man was responsible . This foolishness was mind boggling and disappointingly unexpected - and since then it has coloured my opinion about everything Bob Carr says and believes in . I think Bob Carr is spot on in his assessment. The tenor of the response from the pro-Israel lobby only serves to confirm the sacred cow status this lobby and its narrow viewpoint have enjoyed for far too long in Australian politics and international relations in general. Well, we sure have a strong pro-Muslim lobby group so why is there outrage about other groups? The 'bigot' comment really does Israel and the broader community a disservice. It is possible to criticise certain policies of Israel without being anti-Israel, and certainly without being antisemitic. Reading between the lines, it does look like Danby actually believes Carr is a bigot, he just doesn't like him. He seems quite willing to comment on a book he has not read. To prejudge, perhaps. Perhaps to even be a bit prejudiced against Carr. Bob Carr is right. Danby and the rest of the pro-Israel fanatics have far too much influence on Australian politics. They should be treated as traitors who serve a foreign country. Carr had the courage to speak out and expose the pro-Israel underworld now they do everything including using their influence in the Murdoch press to slander him. Perhaps now there should be a royal commission into the actions of the pro-Israel lobby in Australia. And now we see one of the reasons why Carr wanted the job - to sell a book. I am not sure it is possible, but he just might be more egotistical than Rudd. He was certainly as useless. Its my view that people with strong held religious beliefs are the biggest bigots and the route cause of so much evil in the world. Lets hope we can get back to strong secular government. I'd say, it is Michael Danby's view that is comical, bordering on maniacal. Get over it! You lost and for the time being, Abbott is in power. Spend your time in opposition laying the groundwork for the time when you might be considered to once again lead this country. Are you suggesting the Palestinians get over it? How do you expect someone to get over something that is still happening?